This post is inspired by a recent post on the Withywindle Nature blog about spider watching. Cynthia, a naturalist, blogged about her observations of a spider spinning its web at her father’s house. I loved that she was so mesmerized by the spider and the work that was involved with building a web. She took notes and shared them on her blog. The photo her husband took of her observing the spider was great. It reminded me of the spiders my husband found under our front porch as he was taking out some old lattice. He is not a fan of spiders and, though I didn’t see this in person, I’m pretty sure he jumped super high and swatted the air as if he had spiders crawling all over him when he saw them. He made sure to capture them under a couple of cups so that he could show me how big they were and how brave he was. Or something. I took a picture. OK, so maybe we’re not big spider watchers over here. 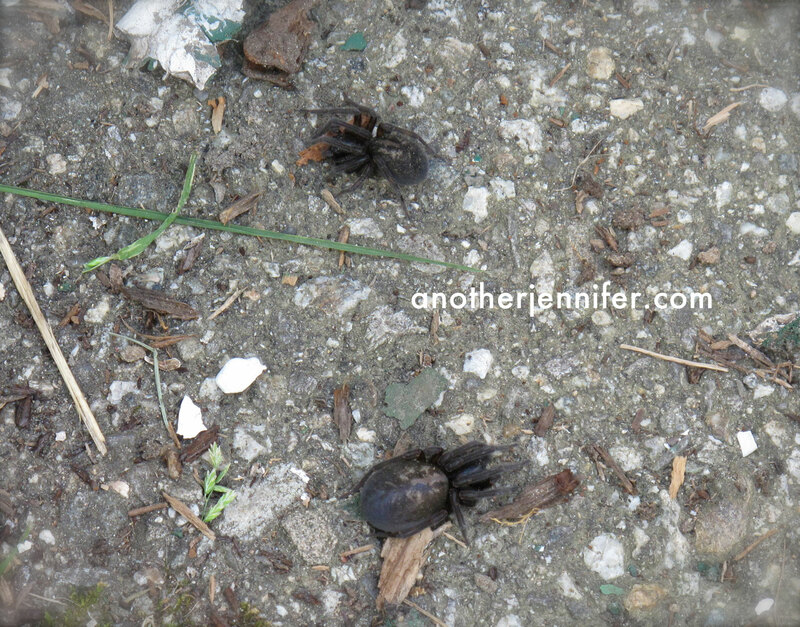 I almost ran away down the sidewalk when I saw these things. What I like about the Withywindle blog is that Cynthia gets me thinking more about nature. And she gets me observing more too. Like when my youngest son and I were playing in our driveway with sidewalk chalk and noted an ant carrying a dead fly. We watched the ant carry it well across the driveway and into the grass. We noted how much bigger the fly was than the ant. And though the ant had some trouble, it kept on going and didn’t give up. 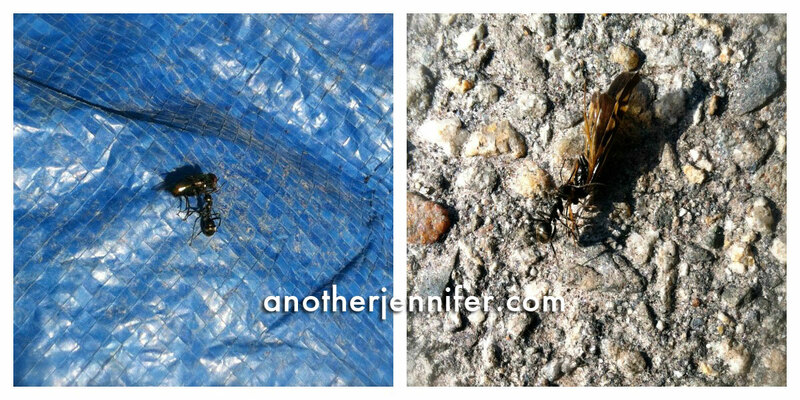 As we watched, we saw that there was another ant carrying what looked to be a dead moth. I watched both ants as they struggled with their catches and disappeared into the tall grass (we need to mow). At this point, Biz lost interest, but I kept watching. I could still see glimpses of the ants carrying their bounty in the grass. And then I saw another one holding a dead ladybug. Here’s where I decided there must be some sort of ant potluck dinner going on. Because, well, I don’t know much about bugs and that was the best explanation I had at the time. What do you think? Linking up with the Withywindle Nature Blog for Windows on Wildlife. I was all mesmerized…. Then I think I spit on my iPad… A potluck dinner. That was awesome. 🙂 only explanation that I see as reasonable. I hate bugs. I’m sure they serve a purpose, as long as they are not in my house. Ha! I’ll take that as a compliment. Sorry about the iPad. 🙂 Cynthia could probably shed some light on what was going on. I like the potluck idea! Thanks for stopping by. Oh my, that spider near the bottom of the photo is absolutely huge! Yikes! Look at that abdomen! I have no idea what the ants would have been up to – but I like the potluck idea. Insects are not my thing, but I know enough about ants to know that they have highly developed social structures. I believe they are the only other species on earth known to go to war – so for all we know, they have potlucks as well! Yeah. The spiders were pretty impressive. And I was thinking that ants were pretty sophisticated. Why not have a potluck dinner party? They each had something different and were going the same way! I’m getting the heebie jeebies just looking at those spiders! Any bugs with fur, or that will crunch under foot, are my husband’s territory. However, my kids would have grabbed their little magnifying glasses and studied those bugs. They, and this post, have made me look at these “piders” (as my son calls them) in a new light. PS – I would have totally would have jumped and swatted at the sight of those webs, too. Yeah. I almost ran away, but I kept my composure. I’m just glad they’re not under my porch anymore.